Imagine the moment when our founding Sisters first stood upon the holy ground of this bluff and shared their vision for a new community. The moment was brief, but its formative value, its effect on those gathered and on an unsuspecting world, is immeasurable. For they heard – Prepare the way of the Lord. Make straight his paths. Fill the valleys. Straighten the roads. Do whatever needs to be done so that all flesh can see the glory of the Lord. and share our vision for a just world. The moment is now; there just is no other. the dream - Are we willing to hear the voices crying out in the desert; allow ourselves to be made low; be broken open? the companions - Look around you, Sisters. Are we willing to abandon ourselves to one another - one another of our past; our present; and our future? the audacity and imagination of the vision- What if we were to practice what we espouse with passion and abandon? What if we invested our time and energy in proclaiming God’s Word, rather than protecting our own personal and communal borders? What if we were to live prophetically? John the Baptist reminds us that we don’t need to wait for perfectly crafted position statements - that’s all about safety and certainty. We do need to choose, to risk, and probably to suffer. We need to do it together and we need to do it now. A world starving for good news cannot be deprived any longer. 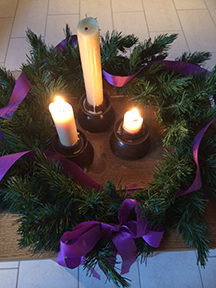 This Advent, let yourself be overtaken by the passion of God. Be transformed by the need of our world for a new way of living. Be astonished by the boldness of your own life. Are you willing to become a prophet and hold nothing back in your proclamation? You know what it cost John. You know what it cost Jesus.